My last upgrade to the Suzuki Swift took the number of cells from 34 to 36 which are still being charged by the 34 cell charger and the legacy 96v charger simultaneously. That upgrade was quite successful in terms of both range increase and power. I also added a rear belly pan which is probably helping improve aerodynamic performance as well. I still have 2 cells sitting in the garage and space for two more cells in the car so the obvious temptation is to put the two cells into that space giving me 38 cells in total. If I do this I will probably have to buy a 38 cell charger. 38 cells would mean my legacy 96v charger will no longer be of use as it cuts out at a pack voltage of 124v dc. I charge my car at three different places, namely, at home, at public charging stations and at friends places when I go visiting. I am fortunate that my house mainly has 16amp 240v circuits. I think the public charging stations even go up to 32amp 240v. The problem is that most of my friends only have 10amp 240v circuits in their houses. If I buy a 3kw charger I will be fine charging at home or at public charging stations but won't be able to charge at friend's places off their 10amp circuits. A 3kw charger would, I estimate, charge at about 25amps per hour (at 139v). If I buy a 2kw charger I will be able to charge anywhere but at a max rate of about 15amps per hour (at about 139v). My question is: Are there any 3kw chargers capable of charging at 2kw by just flicking a switch? In other words if I am at a public charging station I flick the charger over to 3kw but if I am at friends places I can flick the charger over to a 2kw charge? Or could there be a component I could fit between the charger and the pack to regulate kw's going into the pack? Paul9 wrote: A 3kw charger would, I estimate, charge at about 25amps per hour (at 139v). I think you mean 25 Ah per hour, or 25 A. It's actually more like 3000/130 = 23 A, but that's only if the charger can do 3000 W at less than full voltage. The next 3 kW TCCH charger above the 130 V model you have now is 161V @ 20 A. I used 130 V instead of 139 V because 130/35 = 3.42 VPC, where the battery is still taking full current. At 139 V = 3.65 VPC the current and hence power will have tapered off. My question is: Are there any 3kw chargers capable of charging at 2kw by just flicking a switch? I'm not aware of any, except CAN bus models. With the CAN bus, you can just ask for 25 or 15 A max DC out, and the AC input power will be around 10% higher than the DC output power (assuming an efficiency of 91%). 15 A x 130 V x 110% = 2150 W, or 9 A @ 240 V.
Your 124 V charger could be extended to 130 V (at half power), but that's clearly not enough for 38 cells. If you had started with the 108 V nominal (145 A max), you would have had 16 A max current instead of 18 A, but you could have handed the 36 and 38 cell options. Always easy to say in hindsight. Of course, with CAN bus you need a small computer to manage the charge voltage and current. In the MX-5, Weber and I used a Tritium Driver Controls, but there are many options. Full source code is available from Github (Rev61 and Rev58 branches); see the MX-5 build thread for details. Edit: The MX-5 was arranged so that by clicking the keyswitch, you could select between three charge settings, just under 10 A / 15 A / 20 A @ 240 V.
Last edited by coulomb on Thu, 30 Mar 2017, 06:55, edited 1 time in total. I suspected I might get that answer. The TC Charger company seems easy to work with if I wish to specify almost any mix of max voltage and current. When I bought my 34 cell 2 kw charger in August 2015 (hence no hidden button under any sticker) I asked TC to set it up at a 122.4v max which they did. I get 122.4 volts max pack voltage at up to 18amps. At present I have a 2kw charger plus a 1 kw charger (the old 96v charger) both wired up to charge simultaneously. However neither of these chargers would get a 38 cell pack up to the required voltage. The solution, and unfortunately the most expensive solution, would be to buy two new chargers, for 38 cells, one a 2kw charger and the other a 1 kw charger. A brief "google" has revealed that TC Elcon do not seem to make 1 kw chargers any more. And also unfortunately their 1.5 kw charger is too big for the space in which my present 1kw charger is housed! Are there any 1 kw on-board chargers around? I suppose I could always ask TC could they make a 1kw charger? So I suppose $500 USD for the 1.5kw and $650 USD for the 2kw charger including freight. Delivery was 11 calendar days. The tc chargers with the enable option allow you to vary charge rate by putting a resistor on the enable line instead of a direct short. At least they used to. Their new chargers are also a lot smaller volume wise than their old ones. I just checked the manual I received in 2015. The 1.5kw charger dimensions then were 348mm x 180mm x 140mm. The same unit now is 352mm x 195mm x 139mm. This makes the current model slightly larger than the old model unless I am missing something? The newest version chargers have a completely different layout. I just checked, the smallest charger that does above 96v nominal is 3.3kW. It's physically half the size of the old 1.5kW unit. I'm without a computer at the moment, so switching between screens on my half broken phone is a bit tedious. Last edited by coulomb on Sat, 01 Apr 2017, 05:58, edited 1 time in total. Thanks tons for looking that up antiscab! The size of the new 3.3kw charger would certainly fit in the space I thought I would use for the 1kw charger I thought I would need to buy. I think I would still need a 2kw charger for times when I visit friends who only have 10amp 240 circuits in their house. My existing 2kw (34 cell) charger will not get a 38 cell pack up to any more than 122.5v which is 3.22v per cell. I may have to ask TC Charger if they have anything like a 2kw charger for 38 cells. Looks like I will still have to buy two chargers and use one or the other depending on what amps circuit I am hooking up to? antiscab wrote: The tc chargers with the enable option allow you to vary charge rate by putting a resistor on the enable line instead of a direct short. At least they used to. Oops yes! I forgot about that. But as you say, it's not totally clear that the new models have it. Paul9 wrote: I think I would still need a 2kw charger for times when I visit friends who only have 10amp 240 circuits in their house. Well, you could still throttle a 3.3 kW or 3 kW charger back to around 2 kW for when only a 10 A GPO is available, either by CAN bus or by the enable pin, if available. Use your browser controls to zoom in on the above image if necessary. It's 1331 pixels wide. The above is stretched 150% in the horizontal direction to make the text more readable. Perhaps a junior clerk prepared the manual? 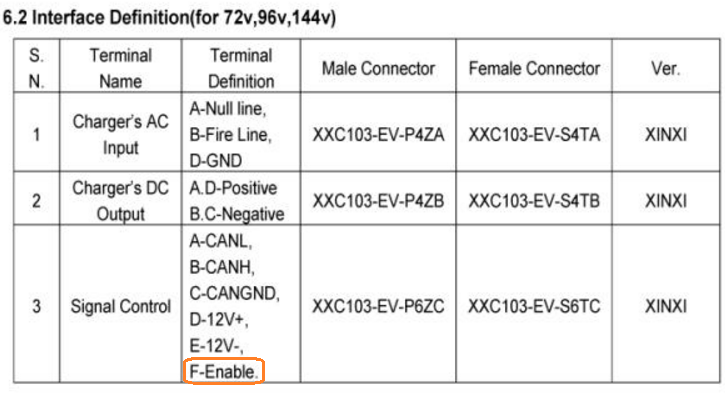 It looks like you might be supposed to PWM the enable signal, to vary the output current. 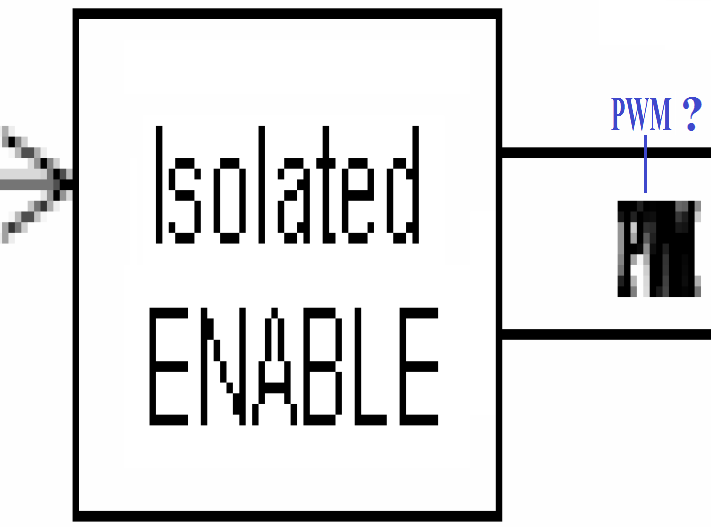 But the control direction is shown as towards the enable block. Perhaps this is just wrong, or I'm reading in too much detail. Some details on this enable pin would be really helpful. Why do we have to reverse engineer products before we can use them, or even find out if they are fit for a purpose? Paul9, maybe you can get one of the suppliers to provide a better manual, or at least clarification of how (and if) the enable pin works. Last edited by coulomb on Wed, 03 May 2017, 09:35, edited 1 time in total. Tomorrow I am going to whip off an email to TC Charger to see what they have available. I will include your comment about the enable pin. Just a suggestion, as you know considerably more than I about both enable pins and PWM, would you like to suggest the correct phrasing for the question I should ask them? So the first diagram at least hints at how to connect to it. It seems that the "D" and "F" labels refer to the D and F pins of the signal control (6 pin) connector. 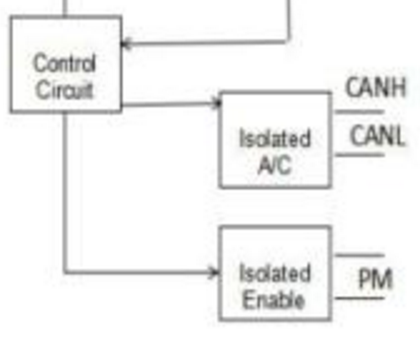 The second diagram (part of a block diagram) shows the enable inputs as "PM", not "PWM" as I assumed. I suppose that this could still stand for "pulse modulation", but that's unusual. Paul9 wrote: Just a suggestion, as you know considerably more than I about both enable pins and PWM, would you like to suggest the correct phrasing for the question I should ask them? Ok, how about the following. They really have left out a lot of important information. 1) Is the enable function suitable for adjusting the maximum charge current using pulse width modulation? Would 17% to 42% PWM ratio represent zero to full rated current (so as to generate an average DC voltage of 2.0 to 5.0 V, as used by earlier TC Charger models)? 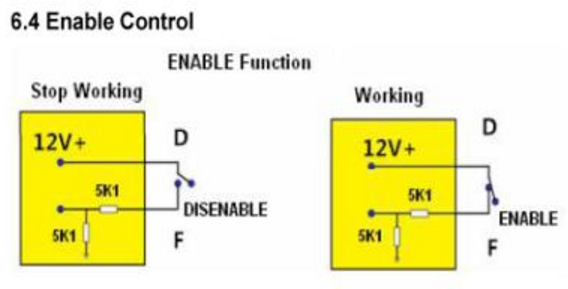 2) Can I use a DC signal from 2.0 to 5.0 V referenced to the E pin of the signal control connector, similarly to the enable signal of earlier TC Charger models? 3) The CAN bus interface is stated as "optional". If the CAN bus is not used, how is the maximum battery charge voltage determined? Does the charger become specific to a particular number of cells in series, with a particular Amp-hour capacity, as it is with earlier TC Charger models? Do I specify the number of cells and their capacity before the sale is complete? Does this process delay the delivery of the charger? 4) If I change my mind about the number of cells in the future, can I just start using the CAN bus, and this will override the number of cells that I specify at the time of purchase? 5) Is the enable input and the 12 V 5A power supply isolated from the battery? In earlier TC charger models, they were not. 6) How do I specify or change the CAN bit rate? The manual states that the CAN Baud Rate is 125/250/500Kbps. Does it auto detect the bit rate of messages sent to the charger? 7) What is the charger's CAN ID, and what ID is it expecting voltage and current requests on? Are these the same as earlier TC Charger models? 8) What is the format of the CAN data packets? Are these the same as earlier TC Charger models? Last edited by coulomb on Sat, 01 Apr 2017, 15:00, edited 1 time in total. After a bit of a delay in receiving a reply from TC Charger in China, I finally received the manuals I think I am wanting. I have received the manuals for the 6.6kw charger, the 3.3kw charger and the 1.8 kw charger which all appear to be the “new” design, being considerably smaller than the “old” design as antiscab advised in a prior post. They also sent me an info sheet on their 700w charger which seems to be the old design which is included in the below file titled “Quotation for TC Charger 2017”. These manuals are attached below for anyone’s reference. Bear in mind, when considering my logic below, that back in 2015 when I bought my existing 2kw charger, I wanted it configured for 34 cells x 3.6v = 122.4 pack voltage. Even though 122.4 v was not an option listed in their 2kw manual, TC Charger offered me 122.4 x 18 amps = 2203.2 watts. When I asked could I get 122.4 x 20 amps they said 18 amps was max for that charger at that voltage. From this I conclude they divide any(?) pack voltage you want into the wattage of the charger to get the amps figure for that charger. I am really thinking out loud here and asking you guys to check, and if necessary correct, any of my calculations and/or logic. Firstly, if I install the two new cells, I will end up with 38 cells. 38 cells times 3.6volts will mean the charger(s) will have to get the pack voltage up to 3.6 x 38 = 136.8v. As a result of the above, my best option seems to be to buy the 700 watt charger and the 1.8kw charger. Options they do list for the 700 watt charger all seem to give a wattage of about 990w. A 0.99kw charger would charge a 136.8v pack at a rate of about 7.236 amps – let’s say 7 amps. However none of the options for the 700w charger go as high as 136.8v but I don’t know if this matters? The options listed for the 1.8kw charger all seem to show the charger charging at a rate of 2376watts. For a 136.8v pack I think this charger should charge at a rate of 2376 divided by 136.8 which equals 17.368 amps. Let’s say 17 amps. Another question is that for the 700w charger the manual says the Charging Control method is “Enable Wire Only”. Does this mean it is CAN Enabled? My BMS is not CAN enabled so I don’t think I want a CAN BUS charger? The manual for the 1.8kw charger says the control method is either CAN BUS or enable wire. Now I am confused! For coulomb's reference, I am still waiting for a reply to your questions. I assume the sales person with whom I am dealing needed to refer your questions to a techo. As usual guys, thanks for your help. Paul I have read a few times that the TC Chargers charge current can be controlled with the Enable pin. "TC Chargers make a line of IP46 water proof and rated to SAE J1378 for vibration and shock resistance chargers making them more suitable for use in vehicles. These chargers also have an enable pin allowing your Battery monitoring system to terminate charge and the output current can be reduced with a simple voltage divider on these pins." If this is the case then a single 3.3kW charger would be the go and you can have simple switch to dial down the current. I guess we have to verify that these later chargers can be current-controlled via the enable pin. Thanks Johny. I would rate this as a Plan B if two chargers won't do the job for me. I think hooking up two chargers would be more within my extremely limited skillset whereas a voltage divider circuit would give me many more ways to stuff up! When I go back to TC Charger I will ask them the question you pose. It's a HQ model, which is a little different to the old design. An intermediate design, if you like. I suspect it has the newer processor type, but as you have noted, they seem to omit the CAN bus interface for this model. Other HQ models that have been available since late 2013 have this new processor and a real CAN interface (capable of more than 2 messages per second). These manuals are attached below for anyone’s reference. Even though 122.4 v was not an option listed in their 2kw manual, TC Charger offered me 122.4 x 18 amps = 2203.2 watts. When I asked could I get 122.4 x 20 amps they said 18 amps was max for that charger at that voltage. From this I conclude they divide any(?) pack voltage you want into the wattage of the charger to get the amps figure for that charger. The chargers have a strict power limit that overrides the current limit. So I think you'll find that you would never have gotten 2200 W, only 2000 W. So at the top end, 122.4 V, you would have been limited to 2000/122.4 = 16.3 A. Fortunately, at the top end, you usually don't need maximum current anyway. At anything less than 2000/18 = 111.1 V, you would have been limited to 18 A. 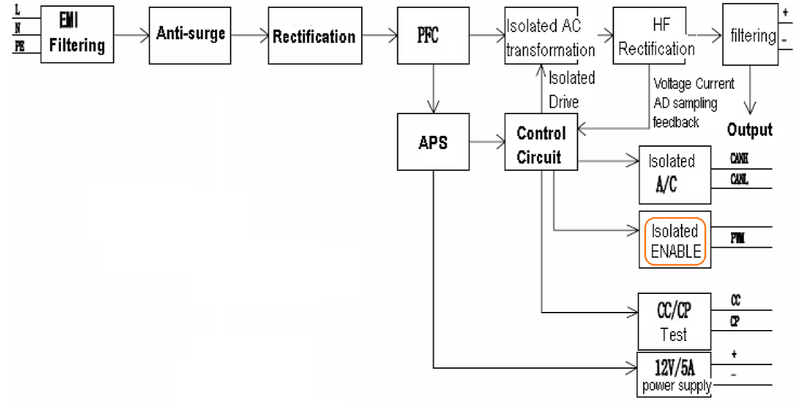 The current limit is set by the output rectifier; the power limit is set by the transformer, the MOSFET current ratings, and the PFC (Power Factor Correction) stage. ... the charger(s) will have to get the pack voltage up to 3.6 x 38 = 136.8v. As a result of the above, my best option seems to be to buy the 700 watt charger and the 1.8kw charger. The problem with that is that the 700 W models only go to 99 V maximum; this won't charge your battery at all. I'm surprised that they haven't mentioned the other intermediate design (HQ) models; these are the older design with the new processor. Maybe they have discontinued those. Options they do list for the 700 watt charger all seem to give a wattage of about 990w. A 0.99kw charger would charge a 136.8v pack at a rate of about 7.236 amps – let’s say 7 amps. As above, if there was a 700 W charger that went to say 138.6 V (1.4x the 99V model's voltage), its current limit would likely be 10/1.4 = 7.1 A, say 7 A (1.4x less current than the 99 V 10 A model). But again this would only be up to 700/7 = 100 V. Above that, it would be limited to 700 W. Suppose your cells started at 3.2 VPC. That would be about 3.2 x 38 = 122 V, where the current is already limited to 700/122 = 5.7 A. However none of the options for the 700w charger go as high as 136.8v but I don’t know if this matters? I think it matters very much, sorry. The options listed for the 1.8kw charger all seem to show the charger charging at a rate of 2376watts. Again, that's the maximum voltage times the maximum current; you can't have both at once. You can have any combination as long as the product (P = V x I) is ≤ 1800 W. Assuming the new models work the same as the old ones. But the 1.8 kW models only seem to go up to 132 V. This might be acceptable, charging your battery to a maximum of 132 / 38 = 3.47 VPC. This is close to 100% SOC, but perhaps not close enough. As per the above, I don't believe that this will work for you. Another question is that for the 700w charger the manual says the Charging Control method is “Enable Wire Only”. Does this mean it is CAN Enabled? No, enable is a separate control method to CAN bus. In an older 700 W manual that I have, it indicates that there is no CAN bus; where the CAN bus would normally be (pins 6 and 7 of the 7-pin round connector) there is now a relay contact telling you whether the mains is present or not. My BMS is not CAN enabled so I don’t think I want a CAN BUS charger? Yes, that seems reasonable. However, on some CAN bus models (e.g. 1.8 kW and above), the CAN bus seems to be optional. The manual for the 1.8kw charger says the control method is either CAN BUS or enable wire. Now I am confused! I think this just means that you can connect two pins to enable the charger, and it will work like a stand alone charger and ignore the CAN bus pins. The big question is, can you provide a fixed voltage at the enable input and get it to limit the output power? This seems like your best option, as Johny mentioned. The voltage divider is actually a piece of cake, and you can't go badly wrong with it. Especially since it seems to be an isolated input (though the manual contradicts itself on that point). It would just be two resistors costing way less than a dollar, which you could probably mount inside the relevant connector. That could happen. Getting technical information seems unreasonably hard. Perhaps a reminder that you still need some technical answers would be prudent. Last edited by coulomb on Wed, 03 May 2017, 04:18, edited 1 time in total. Thanks Coulomb for your reply. I think I get your explanation now! A 2kw charger can supply 2kw max at either a certain max voltage or a certain max amperage but not both at the same time? Yesterday, as an experiment, I checked the existing charger’s performance over a one hour period. I have attached an excel spreadsheet at the bottom of this post. I was measuring both watts and amps at the wall and the resulting pack voltage and amps going into the pack through the TBS Pro. My charger was for 34 cells x 3.6v per cell giving a max pack voltage of 122.4 and a max charging amps of 18. Hence the model number is 122.4 – 18. Multiplying those two figures I get 2203 watts. The charger actually commenced the charge by drawing 2164 watts (9.15 amps @ 240v) at the wall. The TBS Pro was showing a charging rate of 16.5 amps. If I divide the watts by the charging amps I have a theoretical voltage being applied by the charger of 131v. I know chargers are not 100% efficient and these chargers have an AC Power Factor of >98% and a Full Load Efficiency of >93% so I am not sure if the voltage being applied by the charger is in fact 131v. All through the charging process the applied voltage (as I calculate it) ranged between 129v and 131v DC. The charger stopped the charging process when the pack voltage reached 122.4 volts. If the charger was only putting 2kw to the pack at 16.5amps then the voltage being applied would only be 121.2v which would not be enough to get the pack to 122.4. So, though Coulomb’s explanation makes perfectly logical sense to me, it doesn’t appear to be backed up by the performance of the charger – where am I going wrong? Point 2. A reminder to TC Charger about the questions Coulomb posed has achieved a response. NO. Enable only control ON/OFF. NO, There is no such function any more. If CAN interface is not required. Charger is programed with your battery info. If charger without CAN, you cannot changed cells. 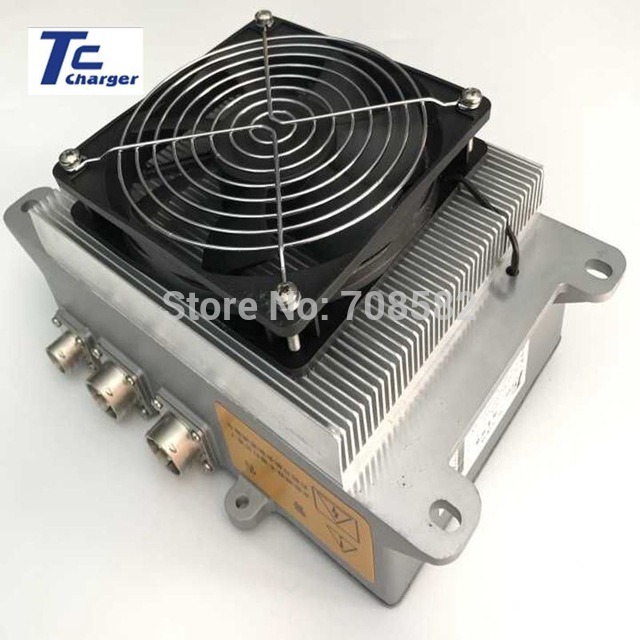 12v 5a is for BMS power supply. It's isolated from battery. CAN bit rate is set when you place order. It's not adjustable for you. I hope the replies answer some of coulomb's queries. Paul9 wrote: A 2kw charger can supply 2kw max at either a certain max voltage or a certain max amperage but not both at the same time? Paul9 wrote: My charger was for 34 cells x 3.6v per cell giving a max pack voltage of 122.4 and a max charging amps of 18. Hence the model number is 122.4 – 18. Multiplying those two figures I get 2203 watts. Yesterday, as an experiment, I checked the existing charger’s performance over a one hour period. I have attached an excel spreadsheet at the bottom of this post. The charger actually commenced the charge by drawing 2164 watts (9.15 amps @ 240v) at the wall. Yes. 2000/2164 = 0.924 = 92.4%, about right for 93% efficiency and a little allowance for power factor. The TBS Pro was showing a charging rate of 16.5 amps. If I divide the watts by the charging amps I have a theoretical voltage being applied by the charger of 131v. But the output power is only about 93% of the input power. In fact, 121.3 V x 16.5 A = 2001.5 W, or bang on 2000 W to the likely accuracy of your measurement equipment. So the charger is limiting itself to 2000 W of output at this point. Your calculated "voltage applied" would be correct if the charger was 100% efficient. Later the current dropped to 13.0 A and 121.6 V, for a power of 1581 W. The battery is essentially at the voltage set-point (121.6 is 99.3% of 122.4 V, and is only 0.8 V low. The TC Chargers have about a 1% "window" around the set-point, as well as about a 1% measurement accuracy from memory. So this is why the power is tapering off. At this point, you see 1698 W at the input, for an efficiency of 100% x 1581 / 1698 = 93.1%. I thought the efficiency might have dropped a little by now. At the end of the data, you have 121.6 V x 9.0 A = 1094 W out and 1177 W input, for an efficiency of 100% x 1094 / 1177 = 92.9%. That's just over half rated power output, and the efficiency is the same, to within measurement error. Not too bad, really. Thanks for the numbers; I've often wondered about the efficiency of the chargers. Looks like it's very close to what they claim. As indicated above, 121.2 V is less than 1% less than 122.4 V, plus it's only 1.2 V short of its goal. Being more than a volt different, however, it put its maximum power of 2000 W into the battery at the beginning. Unfortunately, that means you either need a CAN bus model of the charger, and therefore a BMS that can generate CAN bus packets, or you need a different brand of charger, so do what you want. That's a shame. It would surely have been little effort to retain the enable signal control of power level. I guess they assume that everyone wants to charge as fast as possible, and has unlimited power to achieve that. It's also a shame that if you choose other than the CAN bus when ordering, you are stuck with what you ordered, as with the older models. So you also have to decide between CAN bus and stand alone at ordering time. You can't make a wild guess and fall back to CAN bus if you got it wrong, for example. The CAN bus protocol is essentially the same as the old chargers. So for example a Batrium BMS should be able to talk to these new model chargers, I would think. The "heater mode" (as opposed to charger mode) is new to me. Perhaps it just puts a lot current into the batteries to warm them up. But you could do that by simply requesting a low current. Last edited by coulomb on Fri, 05 May 2017, 19:29, edited 1 time in total. I saw the suggestion in this thread that a possible way to get 2.2kw or 3.3kw out of a single 3.3kw charger would be to use a voltage divider. If I go ahead with adding two more cells to my pack I will need a charger that will give me 38 cells x 3.6v = 136.8v pack. As discussed previously, I will get 3300 watts (max) out of the charger even though it may draw, say, 3500 watts (max) at the wall. b) 2200 watts divided by 136.8 volts = 16.08 amps (say 16 amps). So my first thought, being an accountant and not a “lecktishun”, was “don’t I want an amperage divider not a voltage divider?” I want the voltage to remain the same and the amperage to drop to 16 amps when I am using a 240v 10amp circuit at a friend’s place? So I grab my book “Electricity for Dummies” (I think they aimed that book at me in particular!) and look up voltage dividers. The book seems to say that the resistor(s) in the circuit will reduce the voltage which is not what I think I want. I googled the problem and most answers seem to indicate that the current (amps) will be reduced. They appear to say that the resistor(s) should go in the negative line. My research therefore comes up with divided (pardon the pun) opinions? 1) What logic/maths errors have I made in the above explanation? 2) The closest rocker switch to what I think I need is rated at 20amps at 240v AC. Would this be good enough to handle the voltage and current I need? 3) I have tried to calculate the spec/resistance value in ohms for the resistor I will put from the rocker switch to the NEG battery terminal. However I am getting nowhere! Could someone help here please? Johny wrote: Paul I have read a few times that the TC Chargers charge current can be controlled with the Enable pin. EVWORKS: "These chargers also have an enable pin allowing your Battery monitoring system to terminate charge and the output current can be reduced with a simple voltage divider on these pins." I saw the suggestion in this thread that a possible way to get 2.2kw or 3.3kw out of a single 3.3kw charger would be to use a voltage divider. (I)..look up voltage dividers. The book seems to say that the resistor(s) in the circuit will reduce the voltage which is not what I think I want. Some chargers have "special pins" that has a separate user adjustable voltage that sets the maximum output current. Using a voltage divider WILL adjust voltage to the "special pins" that in turn set the current. But only if the specific charger has those special input pins. Last edited by Richo on Wed, 10 May 2017, 10:46, edited 1 time in total. Forget all that I don't think that this is a good way to solve this problem. Paul9 wrote: I saw the suggestion in this thread that a possible way to get 2.2kw or 3.3kw out of a single 3.3kw charger would be to use a voltage divider. Oops! This was a very low power voltage divider, at the enable input of the charger. To cut down 5 V or 12 V to about 2.5 V. You can't do this between the charger and the battery. For one thing, as you say, you'd need a current divider, but besides that, it just won't work and the charger will still draw around 3550 W max from the wall. Besides, the enable input idea has been put to rest. Sadly, the enable input is apparently now an all or nothing control; you can switch the charge current on or off safely and at low power, but not control the power level to anything other than 0% or 100%. Your only hope with a TC Charger to control the power is to use a small computer with a real CAN bus. Attach a switch to the small computer to tell it to charge at 3.3 or 2.0 kW, or whatever power levels you want. Last edited by coulomb on Wed, 10 May 2017, 14:26, edited 1 time in total. Thanks guys, I see the difficulties involved. Consider the idea dumped!